Finding great "happy" birthday toasts on the web is hard, since most of them are unoriginal, generic, overused or all three. On this page, you'll only find one-of-a-kind toasts for the birthday boys and girls in your life, so you know you're getting an original (no carbon copies here). Take a few minutes to look around here. Great, unique toasts await you and your loved ones, who will appreciate the effort you made to avoid old, tired standards like "here's to you" or "bottoms up." Happy birthday. May this coming year and the years that follow bring you the very height of happiness, health and fortune. Let's all raise our glasses, drink up to our special guest of honor and wish him a very happy birthday! Happy birthday! You are a very special person. On this day, we wish you much health and prosperity, every day for the rest of your life. Here's hoping you only enjoy all the best on your birthday. To a truly wonderful person: may each of your birthdays find you in good company...among good friends, family and very, very good food. Just like today! Here’s to a lady who is just like a gem to me...rare, beautiful and majestic. I hope you have many more years to celebrate a life so rich! Happy birthday! On your birthday and all through your life, may you have a full life with a full belly, a full wallet, a full heart and a full spirit. Happy birthday! Here's to a bubbly, bopping, drinking, giggly, raising-the-roof, happy-go-lucky and sloppy good time. In other words, it's party time. Let’s party like it's your birthday! May joy grab you, peace warm you, trouble avoid you and the love of family and friends forever bless you. Happy birthday! May your troubles be few and your blessings many. 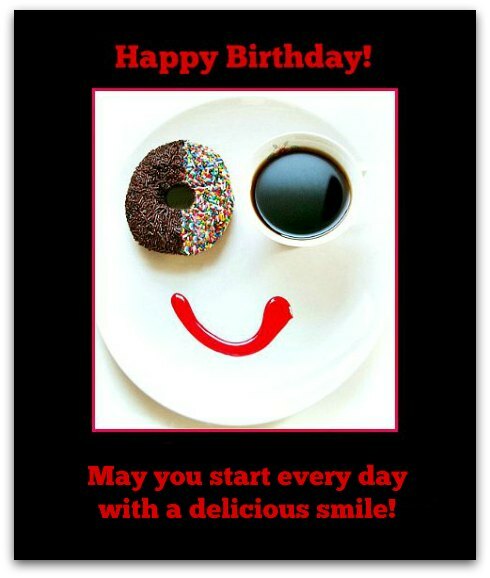 May only happiness find you morning, noon and night, starting with your birthday today! May you be impoverished in hardship, wealthy in joy, unhurried to create foes and hasty to make friends. Happy birthday. Happiness comes to those who keep looking! May everything you dream of be everything you receive. Have an amazing birthday! This is to congratulate you on adding another candle to your cake of life. May the glow from your birthday candles brighten your days. Have an incredible birthday! May this be your happiest birthday yet. And, most of all, may the love surrounding you today follow you wherever you go in life! Cheers! Happy birthday! May you receive the greatest birthday gift you can think of…plus more love and joy than you ever thought possible! You're another year older, another year wiser, another year calmer, another year bolder and, most importantly, another year with us. Happy birthday! I think I speak for everyone when I say that I'm so happy that you've been blessed with another year. May this birthday be the best one yet. I can only wish that you have the best birthday ever — it’s up to you to make it happen! We’re here to help you, so let’s get started with your celebration! You are a good friend who deserves to have all the wishes you desire come true, especially on your birthday. Have a wonderful celebration! Celebrating your birthday brings such joy to everyone around you, including me. If you feel just half the joy we feel now, this could be your best birthday yet. Now let’s party!